LONDON (AP) Serena Williams says it isn’t fair that she has been drug-tested more than other American tennis players this year. ”Just test everyone equally,” the seven-time Wimbledon champion said Sunday at a pre-tournament news conference. 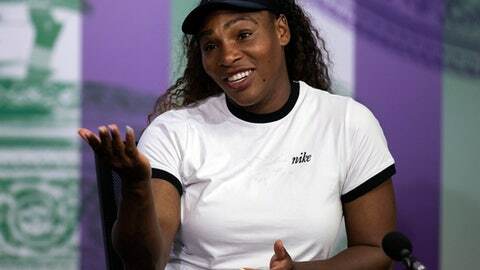 She was asked about the issue because of a recent report by Deadspin that said Williams had been checked five times in 2018 by June, more than other U.S. women and men in the sport. U.S. Anti-Doping Agency spokesman Brad Horn told The Associated Press that the five tests conducted on Williams were a result of three visits from a test collector. ”It is standard practice on many testing missions to obtain both urine and blood samples, resulting in multiple samples from a single testing mission,” Horn said. Williams returned to competition this season after missing more than a year as a result of pregnancy. The 36-year-old American gave birth to a daughter last September. Williams said she found it ”a little frustrating” that she was deemed to have missed a test last month when a sample collector showed up at her house about 12 hours earlier than the time she had indicated she’d be available. ”I’m totally OK with testing and I encourage it,” Williams said. As part of USADA’s ”intelligent” out-of-competition testing program, it is not unusual for top athletes – those who have had sustained success in their sport – to be tested more often than others. It also is not unusual for athletes who have taken long breaks to be subject to additional testing because of natural physiological changes that might have occurred during the time off. Tennis players can be tested by more than one agency, too. Williams’ complaints about unequal testing were mentioned Sunday to Roger Federer, who estimated he has been tested seven times in the last month, including in-competition and out-of-competition. ”I think it varies from place to place that you spend your time in. Maybe that’s the part I don’t like so much: the inconsistency of the places where they test,” Federer said, adding that more funding is needed for doping control. AP National Writer Eddie Pells in Colorado Springs, Colorado, contributed to this report.